Continue to increase your wealth by adding friends. Home / Adviart Blog / Continue to increase your wealth by adding friends. Continue to increase your wealth by adding friends. 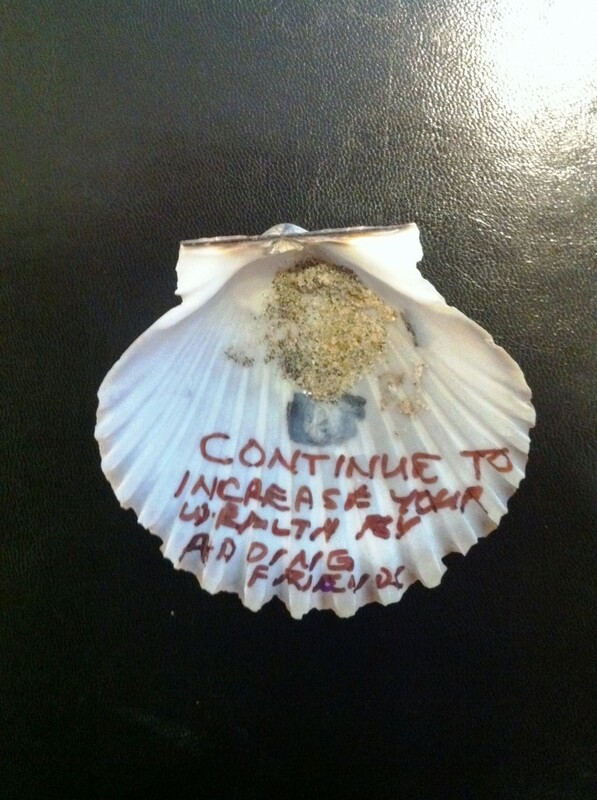 This adviarter decided to write on the bottom of the shell in all capital letters in a brown marker. The advice coming from experience in moving through life and seeing the impact that friends can have on a life. It is noticeable that the adviarter did not remove the sand from the shell–grains still remain attached from when it was picked off the ground. Everyone wants to increase their wealth–that statement is even more true when you think of the different ways that wealth can be defined. In this case, wealth is defined by friends. Friends might not be an absolute statement of wealth but certainly can encompass a thorough definition of wealth. So how do you make sure you are adding friends to your network? What makes it possible to go out and meet others? Is it effort, availability, willingness to meet others, a constant commitment to growing a circle? How do you define wealth? Are friends part of your definition?